We have another famous and quoted person on staff! This one was a little slow to reach my radar, but in last weekend's Washington Post magazine, our own Erin Schwartz is quoted in their "Design Trends" section. The fixture pictured is a Murray Feiss F2537/4SLP. 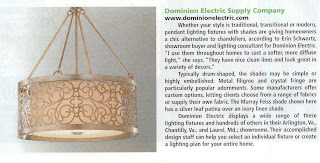 Here's what the blurb says: Whether your style is traditional, transitional or modern, pendant lighting fixtures with shades are giving homewoners a chic alternative to chandeliers, according to Erin Schwartz, showroom buyer and lighting consultant for Dominion Electric. "I use them throughout homes to cast a softer, more diffuse light," she says. "They have nice clean lines and look great in a variety of decors." Typically drum-shaped, the shades may be simple or highly embellished. Metal filigree and crystal fringe are particularly popular adornments. Some manufacturers offer custom options, letting clients choose from a range of fabrics or supply their own fabric. The Murray Feiss shade shown here has a sliver leaf patina over an ivory linen shade. 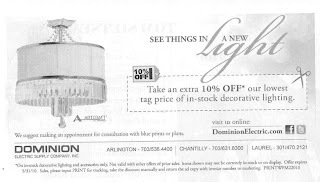 And then we also had an ad in the magazine. You're welcome to print it from here and bring it in for the 10% off! This fixture is an Artcraft AC743 and is a perfect example of a drum shade adorned with crystal fringe!